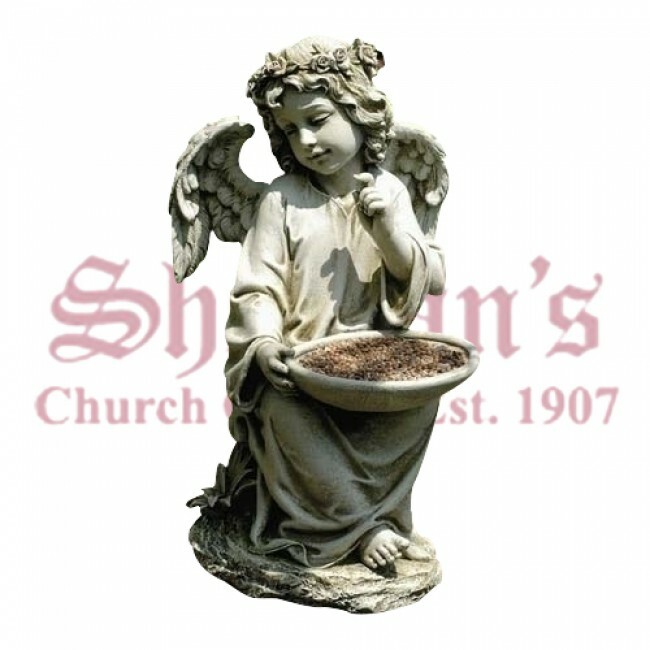 Sitting Angel Bird Feeder Garden Statue – 14.5"
Sitting Angel Holding Birdfeeder Garden Statue 14 ½"
Roman Inc., Sitting Angel Holding Birdfeeder Garden Statue 14 _"
The beautiful Sitting Angel Garden Statue features a finely crafted angel holding a bird feeder. The angel is depicted with large wings and a peaceful expression. To use the bird feeder, simply fill the dish with birdseed and set it in an open space. The bird feeder may also be used as a birdbath by filling it with water. The lovely piece is made of a waterproof resin and stone mixture with a weathered finish for an aged appearance. The detailed piece makes a beautiful addition to any home or church garden. You're reviewing: Sitting Angel Holding Birdfeeder Garden Statue 14 ½"